Portland, OR (February 7, 2018) Howard Shifke fully recovered from Parkinson’s disease. 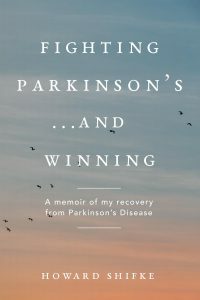 Howard recently released his inspirational memoir, Fighting Parkinson’s…and Winning, which presents his story of getting Parkinson’s and provides a detailed account of how he won the fight against it. On March 13th, Howard will discuss his new book about the extraordinary journey of self-healing. Place: National University of Natural Medicine, NUNM Academic Building, Room 107, 049 SW Porter Street, Portland, OR 97201. Park in the parking lot to the West of the building. Parkinson’s Resources of Oregon’s Alternative Treatment Support Group is sponsoring this free event. Books will be available for purchase. About the Author: In the fall of 2009, Howard Shifke was diagnosed with Parkinson’s disease. His mother had Parkinson’s for twenty-four years before dying in 2007. Watching her physically deteriorate from the disease and mentally deteriorate from the medications was difficult and frightening. Howard did not want to end up the way his mother had ended up with the disease. Fortunately, in 1999, Howard had started studying alternative healing and Traditional Chinese Medicine. In the ten years leading up to his diagnosis, he learned how the body has the ability to heal itself. As a result, Howard decided he would endeavor to recover from Parkinson’s, and he developed an alternative treatment methodology called his Parkinson’s Recipe for Recovery®. Nine months later, he won the fight against Parkinson’s with his full recovery. In Howard’s two neurologist visits subsequent to his full recovery, his neurologist put him through all of the tests used for the original diagnosis. Both times, his neurologist documented in Howard’s medical records that there were no signs or symptoms of Parkinson’s Disease. Howard has been symptom free fully recovered from Parkinson’s since June 12, 2010. Since then, five other people have recovered from Parkinson’s following Howard’s protocol.